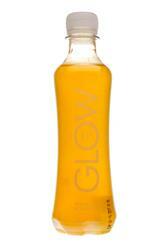 Glow is a two-SKU line of functional supplements designed to help promote hydration, energy, and recovery. The company offers “Hydration” and “Energy” varieties, both of which appear to have the same flavor. Regardless of variety name, their primary purpose appears to be to reduce the effects of a hangover. Both the bottle and web site speak to a proprietary formula (in this case, it’s called “X-FACTOR”) that requires a decent leap of faith by the consumer. This is an approach that has been tried time and time again (Code Blue, Urban Detox, and others come to mind). The only thing that really seems different is the use of 5-HTP (for brain function), but there’s no way to look at this formula and determine how efficacious it is. At least with the energy formulation there’s 90mg of caffeine, which is on par with a standard 250ml energy drink. 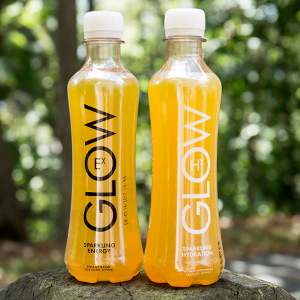 Inside the bottle, there’s an acesulfame potassium and sucralose sweetened formulation that tastes very much like an apricot flavored diet soda. There’s some heavy functional flavor to it, while the sweeteners, which don’t exactly qualify as “premium,” linger at the finish. This is, unfortunately, one of those products that you basically have to tolerate in order to get it down. Assuming they are going to continue to position this as a premium product, we think this needs work. 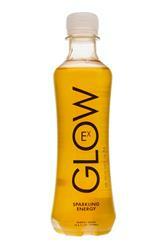 That leaves the packaging and branding as Glow’s final place to really stand out. Unfortunately, that, too, needs some help. While the shape of the bottle is fine from a visual perspective, having a clear bottle when both of the products are the same color is confusing. Plus, the front panel copy, which says either “Sparkling Hydration” and “Sparkling Energy,” doesn’t really speak to the product’s point of differentiation or the key attributes. However, what’s even more important is that the brand doesn’t feel overly approachable or visually strong. From our vantage point, there’s a reason that we’ve seen so many companies try and fail (or limp along) to get consumers excited about this product: its use occasion is, at least for most people, rather limited. And when these occasions do arise, the consumer has to remember, in advance, to have these types of products on hand. At best, these products are niche offerings that are struggling for a slice of a rather small pie. This ultimately leaves Glow in a place where it can either refine and innovate within this category, hoping to grows its share or that the tide all of a sudden turns, or innovate in a slightly more broad direction. Otherwise, we think it will follow the same road as the competition that has gone before it.